Plug & Play No additional drive needed, portable player plug and play. The product is powered by the USB port on your computer. Please hook up the device to the direct USB port on your computer. 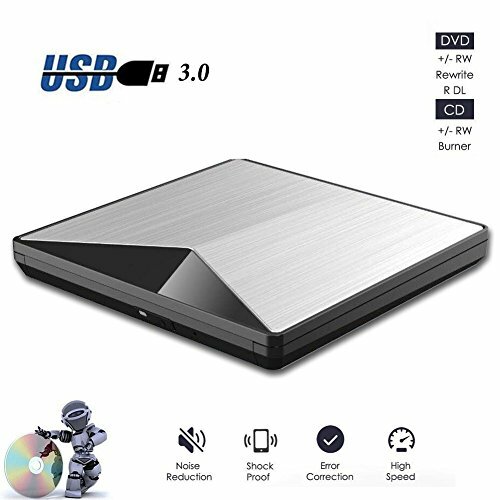 If you connect it to a USB hub or extension cords, it maybe cannot recognize the Driver or read the CD/DVD. For the desktops, please connect the device to the USB port of the motherboard for normal use. High Speed: This product uses the latest USB 3.0 technology. Pure copper braided wire has small process impedance, stronger shielding effect and more stable data transmission. Fashion Design: Alien style pop-up DVD recorder, using a combination of mirror and aluminum alloy processing. The movement uses a 9.0 slim movement. Ultra-thin, ultra-light, classic design. Plug and Play: No needed complicated Installer. You can record CD, music, videos, install software or create CD/DVD backup disc. easy to carry you can put it in the traveling bag or on your desk. Multi-Function: Low power consumption, no external power supply required; Extra strong error correction ability, shockproof, low noise, horizontal or freestanding operation. Full support for DOS boot and system recovery issues. If you have any questions about this product by Sunreal, contact us by completing and submitting the form below. If you are looking for a specif part number, please include it with your message.